This speedy and impressive salad gets lots of zing from preserved lemons and quickly pickled onions with plenty of fresh flavor from the chopped herbs. 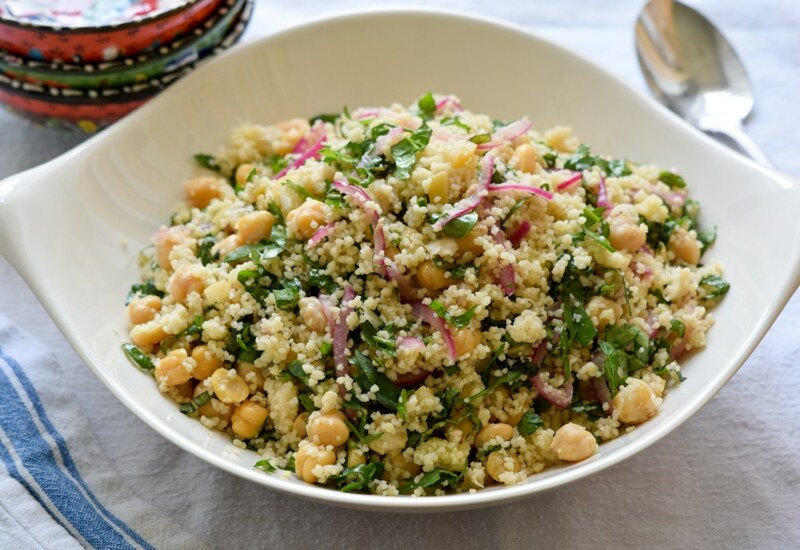 Cooked couscous is combined with spinach, chickpeas, preserved lemons, fresh mint, fresh parsley, olive oil, and salt. Red onion that has been quickly pickled in red wine vinegar is added and the salad is done! Serve it right away or make it ahead for a picnic or potluck. This is also a great dish for a deskside lunch when you can't get away during a busy work day. Don’t have enough time to plan a big meal? No problem, add some shredded rotisserie chicken and you’ve got yourself an instant dinner! Per Serving: 343 calories; 9g fat; 56.4g carbohydrates; 12g protein; 0mg cholesterol; 1140mg sodium. This couscous salad is incredibly quick and simple to make. It's also very delicious! The lemon, mint, and parsley give it incredible flavor. It's definitely one of my new favorite dishes. This is definitely one of my favorite salads. It's a wonderful texture balance between the chickpeas and couscous. The mint and parsley also give it a nice flavor. This is one of our favorites to eat with dinner and double the batch for when we have company. I've only had couscous in traditional, African dishes, so this Mediterranean-inspired version was different but I like the way it turned out. The pickled onions was a nice touch, glad I tried it. Perfect salad but I had to use quinoa instead of couscous. I made the pickled onions the night before so they were very flavorful the next day. Perfect for get together and also love it for my weekly lunch meal prep. Shredded rotisserie chicken was the perfect addition to this couscous salad. I actually used a lemon herb rotisserie chicken that cost a couple bucks. Perfect for spring, I am definitely going to make it again.